Alpha particle. A helium-4 nucleus (consisting of 2 protons and 2 neutrons) emitted by a larger nucleus during the course of the type of radioactive decay known as alpha decay. Astronomical Unit (AU). The distance from the Earth to the Sun, which is about 93 million miles. Atmosphere. The air enveloping a planet. Atom. The smallest part of a substance which can exist and still retain the properties of the substance. All familiar matter consists of atoms. An atom consists of a positively charged nucleus and orbiting electrons. The simplest atom is hydrogen (one proton and one electron), and the largest atom in nature is uranium (92 protons, 92 electrons, and 146 neutrons). Auroral emissions. The luminous phenomena seen in the night sky in high latitudes, occurring most frequently near the Earth's geomagnetic poles. The aurora is caused by the interaction of the atoms and molecules in the upper atmosphere with the charged particles streaming from the sun, attracted to the auroral regions by the Earth's magnetic field. Bow shock. The first result that appears from the interaction of the solar wind and a planet's magnetic field. When the solar wind strikes the planet, it generates a stationary shock wave, the bow shock. It is recognized by an abrupt slowing of the solar wind and a corresponding change in the magnetic field. Coronal mass ejection. The corona is the outermost layer outside of the sun's atmosphere. It is constantly expanding into space to form the solar wind. Sometimes the wind blows out steadily, but at times the sun ejects large magnetic field structures called coronal mass ejections. When the materials from these ejections reaches Earth, it can cause the aurora or potentially disruptive effects like power outages in cities near the magnetic poles. Cosmic rays. High-energy particles that fall on the Earth from space. The nuclei of all chemical elements are present. Ecliptic. The plane in which the Earth and all of the other planets orbit the Sun. Electron. An elementary particle with a negative charge. Galactic matter. All forms of matter originating from outside the solar system. Familiar chemical elements are present. Exotic types have been sought but not found to date. Galileo. On Jan. 7, 1610, in Padua, Italy, Galileo Galilei aimed his newly invented telescope at Jupiter, the giant planet of the solar system. He noticed 4 objects changing position around Jupiter; he had discovered 4 satellites (moons) revolving around the planet. These 4 large moons have been named Io, Europa, Ganymede, and Callisto. 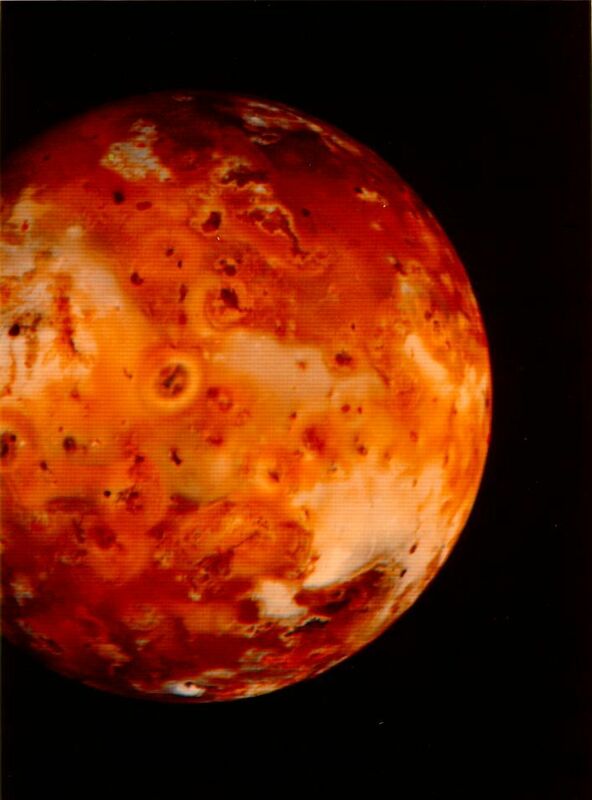 It is fitting that NASA named their Jupiter mission, launched in 1989, Project Galileo. Gamma rays. Electromagnetic radiation emitted by excited atomic nuclei during the process of passing to a lower excitation state. Heliosphere. The solar wind particles flow out past the farthest planets to form the realm we call the heliosphere. Interplanetary medium. The space between the planets and the sun within the solar system. Interplanetary shock. A shock that occurs between the planets and the sun within our solar system. Interstellar medium. The space between the stars. Io. One of the 4 largest moons of Jupiter. The moons are called Callisto, Ganymede, and Europa. Ion. An atom or group of atoms that either lost one or more electrons, making it positively charged, or gained one or more electrons, making it negatively charged. Ionosphere. The region of the atmosphere which is populated with permanent ionized particles. Jupiter. The fifth planet from the Sun. Known as a giant gas planet, Jupiter's diameter is 11 times that of Earth and its mass is about 300 times that of Earth. Magnetic field. A field of force that exists around a magnetic body. Electrical currents also cause magnetic fields. Magnetic storm. Disturbances in a planet's magnetic field caused by transient currents above the atmosphere. Magnetopause. The boundary which separates the domain of the solar wind and the planetary magnetic field. It is recognized by an abrupt change in magnetic field strength and direction. Magnetosheath. The region of space located between the magnetopause and the bow shock. Magnetosphere. The comet-shaped region around a planet where the planet's magnetic field is dominant and excludes the solar wind. Magnetotail. The magnetic field lines in the region downstream of the planet. It is pointed away from the Sun and resembles a cometary tail. MeV. Million electron volts. A unit of energy equal to that of an electron having been acted upon by a million volt electrical potential difference. Ozone layer. A region above 20 km altitude filled with O3 molecules. Plasma. Gas mixtures of electrically charged particles, such as electrons and ions. It can be found in magnetospheres, ionospheres and the solar atmosphere. Proton. An elementary particle with a positive charge, equal in magnitude to that of the electron. Radiation. The emission of rays of light or heat or atomic particles. Solar corona. The outermost portion of the solar atmosphere; contains a very hot plasma about 2 million degrees centigrade. Solar cycle. The sun is active and shows an 11-year periodic variation in the number of sunspots (dark regions) on its surface. Solar flare. Bright spots on the sun, called flocculi, burst into solar flares, which give off so much radiation that their effects can be felt as magnetic storms on Earth. Solar wind. Very hot coronal gas from the Sun which expands outward into the solar system and fills interplanetary space. Space physics. The study of solar system plasmas. Storm Sudden Commencement. An abrupt rise in the magnetic field at the onset of the storm. Subatomic. One of the constituents of an atom. Example: en electron or a proton are constituents of an atom. Subsonic. A speed that is less than the speed of sound. Sunspot. A dark patch in the sun's photosphere (outer shell) resulting from a localized fall in temperature to about 4000K. The cause is thought to be the presence of intense localized magnetic fields, which suppress the convection currents that bring hot gases to the photosphere. Supersonic. A speed that exceeds the speed of sound. Van Allen belts. Regions that are sources of intense radiation surrounding the Earth, consisting of high-energy charged particles trapped in the Earth's magnetic field within which they follow roughly helical (spiral-shaped) paths. They extend from about 500 miles altitude to about 40,000 miles. These belts were discovered in 1958 by James Van Allen as a result of radiation detectors carried by Explorer satellites. X-rays. Electromagnetic radiation of shorter wavelength than ultraviolet radiation produced by bombardment of atoms by high-quantum-energy particles.